This tortellini soup is a complete meal in one pot that’s ready in less than 30 minutes! It’s full of sausage, beans, veggies and cheese tortellini, all cooked in a savory tomato broth. I make soup at least once a week, it’s quick, easy and my family loves it. 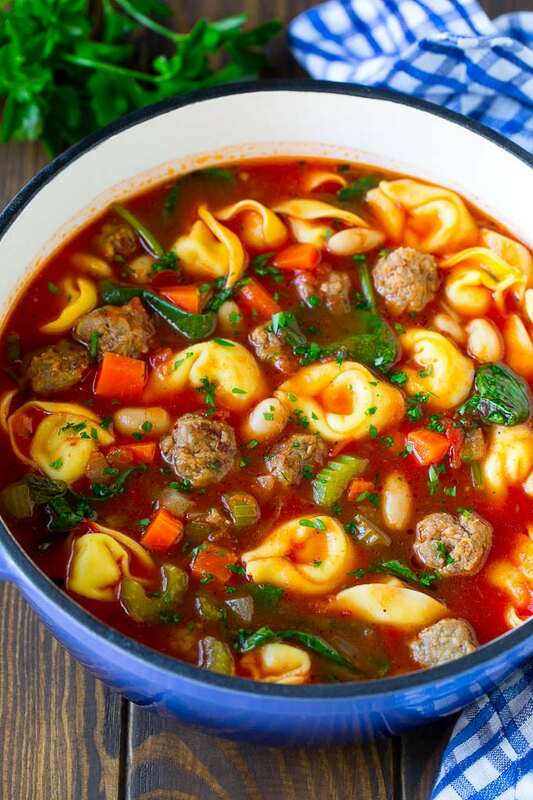 Some of our favorites include Italian wedding soup, cheeseburger soup and this tortellini soup. With school in session, I am ALL about the quick and easy dinner ideas. Our after school activity schedule can be crazy sometimes, and after a long day the last thing I want to do is spend hours in the kitchen! 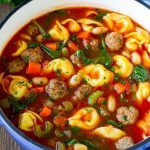 This tortellini soup with sausage is a simple one pot meal that’s got it all: veggies, beans, plenty of sausage and tender cheese ravioli. It’s a complete dinner that’s ready in no time. And best of all, my kids adore it! How do you make tortellini soup? This tortellini soup recipe starts with some veggies – onion, carrot and celery to be exact. 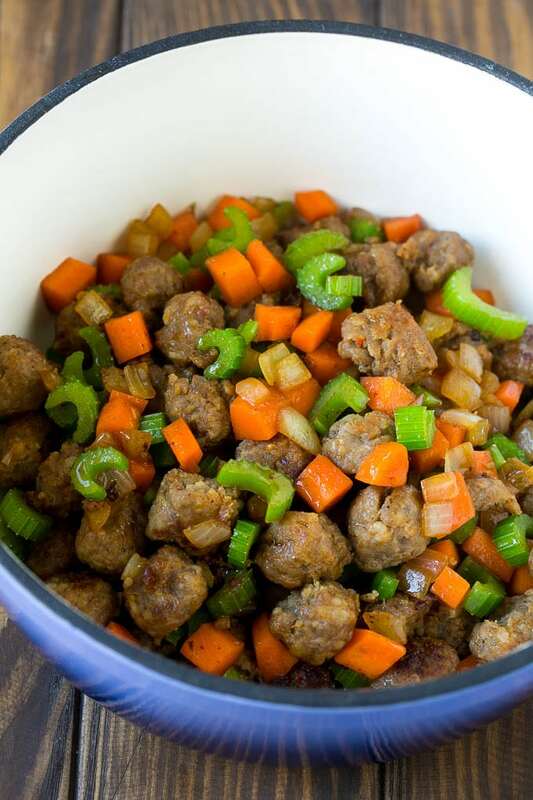 The veggies are cooked in a large pot, then in goes a package of mild Italian sausage. 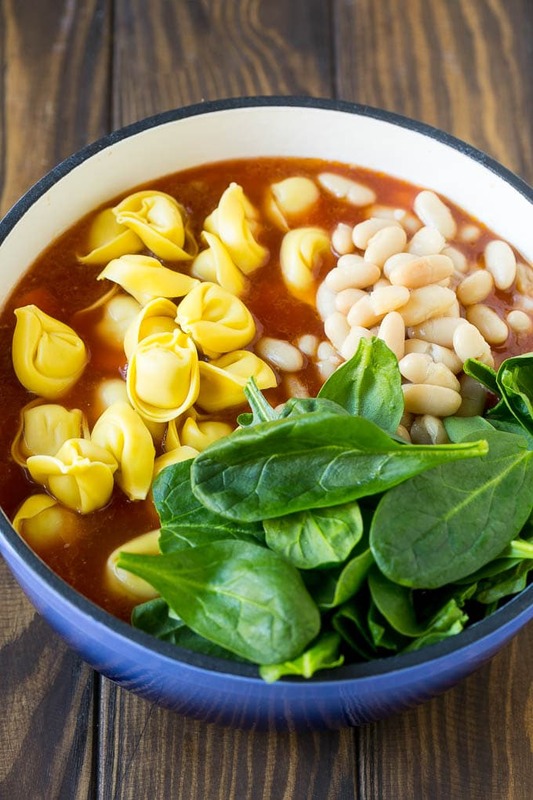 The sausage and vegetables are simmered with canned white beans, fresh spinach and cheese tortellini for a hearty and satisfying soup that will please the whole family. To get this soup on the table even faster, I often chop my vegetables earlier in the day or the night before. You can use turkey, pork or even chicken sausage in this recipe. This soup can be made ahead of time – simply omit the tortellini and stir them in when you reheat the soup. The soup will keep for 4 days in the refrigerator or up to 2 months in the freezer. This soup is a great candidate for the slow cooker! Brown your veggies and sausage on the stovetop, then add all the ingredients to the crock pot with the exception of the tortellini and parsley. Cook on high for 2 hours or low for 4 hours. Stir in the tortellini during the last 15 minutes of the cook time. Sprinkle with parsley, then serve. There are so many different ways to customize this soup to your taste preferences! Meat: Try cubed chicken or ground beef instead of sausage. Tortellini: Use a different flavor of tortellini, or use small ravioli instead. Vegetables: You can add other veggies to the mix such as mushrooms, zucchini, bell peppers or potatoes. Beans: While I typically use white cannellini beans, red kidney beans or chickpeas are also great choices. Once you try this soup, you’ll find yourself making it on a regular basis! It’s so simple to make, yet hearty enough for the biggest appetites, and kids love it too! 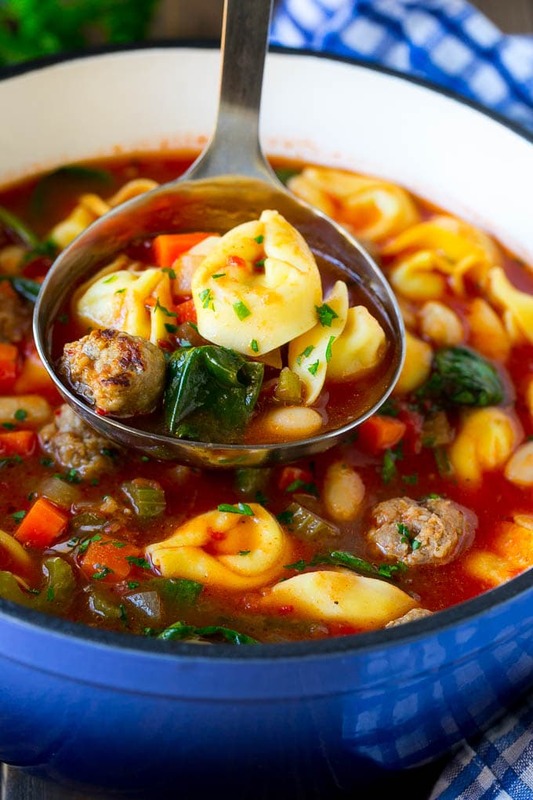 This tortellini soup is a complete meal in one pot that's ready in less than 30 minutes! It's full of sausage, beans, veggies and tortellini, all cooked in a savory tomato broth. Heat the olive oil in a large pot over medium heat. Add the onion, celery and carrots to the pan and cook for 4-5 minutes or until just softened. Season the vegetables with salt and pepper to taste. Add the sausage to the pan; cook for 5 minutes, using a spoon to break up the sausage into smaller pieces. Add the chicken broth and crushed tomatoes to the pot, then bring to a simmer. Add the tortellini, spinach and white beans to the pot, cook for 5 minutes. Season the soup with salt and pepper to taste. Stir in the parsley and serve. This post is sponsored by Johnsonville. Thank you for supporting the brands that make Dinner at the Zoo possible! This post was originally published on September 7, 2017 and was updated on April 9, 2019 with new content. 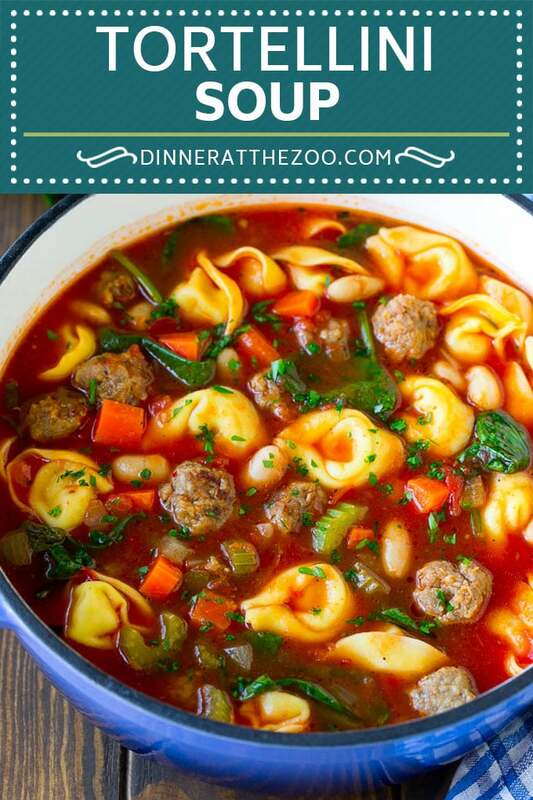 Sausage and tortellini is a winning combination so this soup sounds like my idea of heaven! I love sausage and tortellini and have been dying for a good soup recipe, thanks for sharing! This looks so hearty! Total comfort soup! 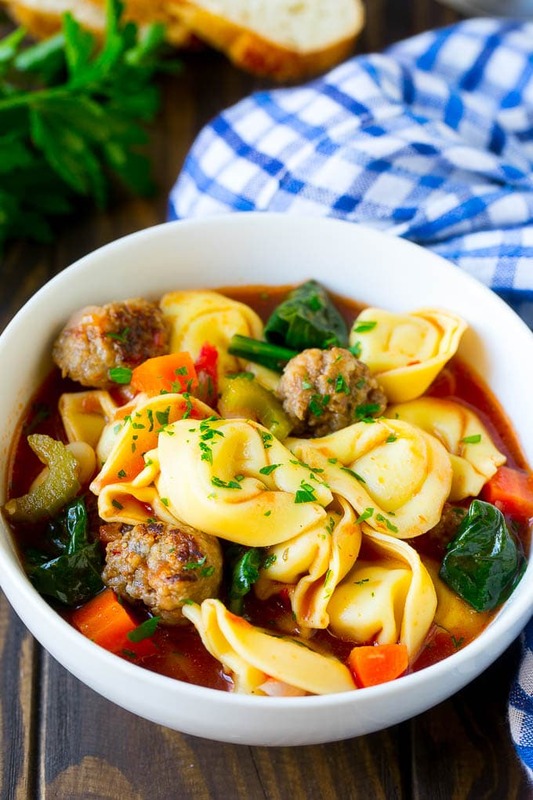 Yummy tortellini soup is so comforting and a complete meal too¡ I love that you added mini meatballs and veggies too. Need a bowl of this soup now. Is it 9oz of tortellini or 19oz? All of the packages at my grocery store are so big, it made me unsure! Thank you so much for your quick reply. Making this for dinner! Made this tonite! Delicious!! EASY/Fast which I like, filling & way more than 6 servings!! I added a dash of red pepper! I will definitely be putting this dish into my fall/winter menu planning! How much is considered a serving? I made this tonight and it was delicious. My husband is counting his calories and we weren’t sure what you consider a serving size. Most excellent, but I never cook pasta in the pot…I cook it separately and add into the bowl as I serve it…It keeps the pasta from being mushy in the leftovers. I added a bit of crushed red chile and sauteed with the sausage and vegetables. Delicious! Good looking comfort food which would be a great group pleaser. This makes my mouth water! My family really enjoys the one pot meals like this. I would probably make a double recipe and freeze some of it.